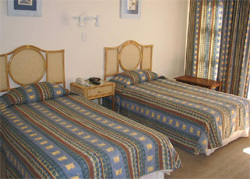 Henties Bay accommodation Guide - information and photographs of Byseewah Guest House Henties Bay Namibia. 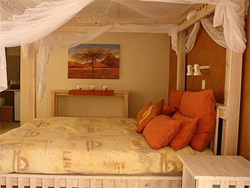 Set in the magical town of Henties Bay, 100 meters from the beach, and within day-drive distance from the many desert attractions and activities, this 3 Star establishment offers accommodation to tourists and fishermen. 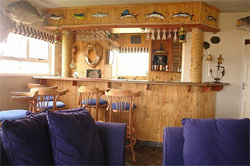 Emphasis is on quality, personal service, good food and tranquil atmosphere. Listen to the sea, enjoy the fresh air, cool evenings, good company, fine wine and well prepared meals in the comfort of our dining room and ladies bar. Central to the Namib, the lodge is an obvious and convenient heaven-sent home base to use whilst discovering the secrets of the oldest desert in the world. We are 72 km north of Swakopmund, in the quaint town of Henties Bay. 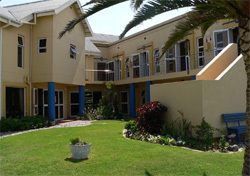 Our Guesthouse is 200 m from the Atlantic ocean, in Auas Street.